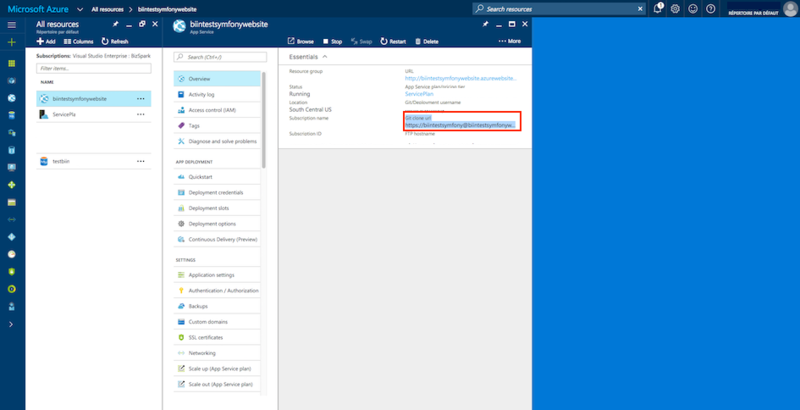 This step by step article describes how to deploy a small Symfony web application to the Microsoft Azure Website cloud platform. It will explain how to set up a new Azure website including configuring the right PHP version and global environment variables. The document also shows how you can leverage Git and Composer to deploy your Symfony application to the cloud. Here, you will be prompted to fill in some basic information. For the URL, enter the URL that you would like to use for your Symfony application, then select your Subscription, Create a new Resource Group (which is a collection of resources that share the same lifecycle, permissions and policies). Pick ClearDB as a Database Provider. Create a new App Service plan/Location you will be prompted to set up your app service plan with a name, a region and a pricing tier. Then create a new Database, you will be prompted to set up your MySQL database storage with a database name and a region. The MySQL database storage is provided by Microsoft in partnership with ClearDB. Choose the same region you selected for App Service plan. Once you created the web site, select All resources in the left menu and choose the website you just created. 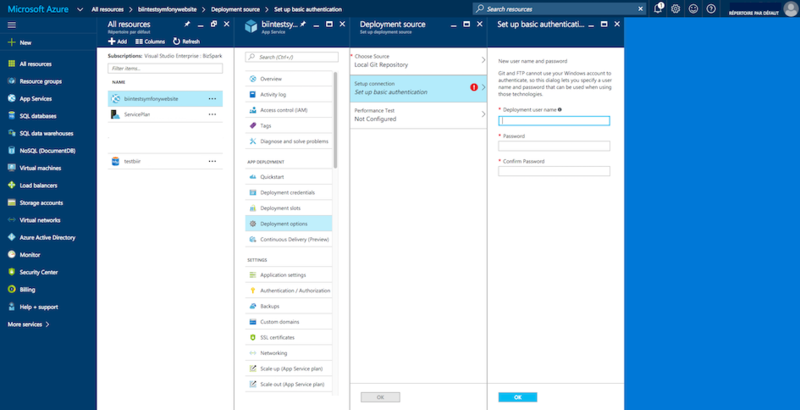 Now, select Deployment options under APP DEPLOYMENT, select Choose Source and choose Local Git repository to configure your Azure Website credentials. If you choose a different source like GitHub or Bitbucket you can ignore the next step. Once you selected Local Git repository, click Setup connection you will be prompted to create a username and a secure password: these will become essential identifiers to connect to the FTP server and also to push your application code to the Git repository. 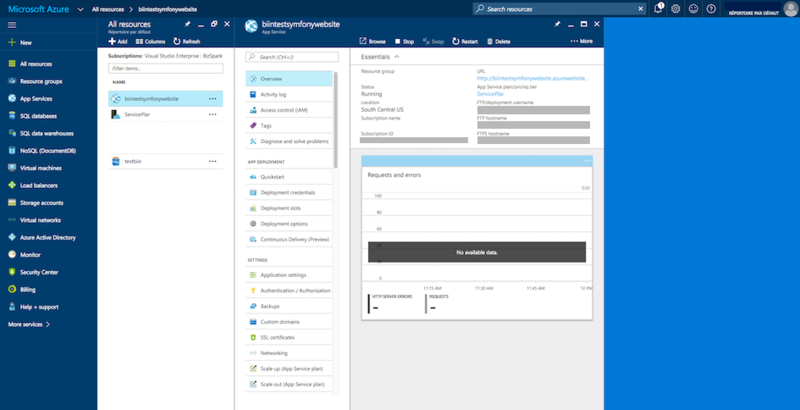 The Microsoft Azure portal also provides a complete control panel for the Azure Website. 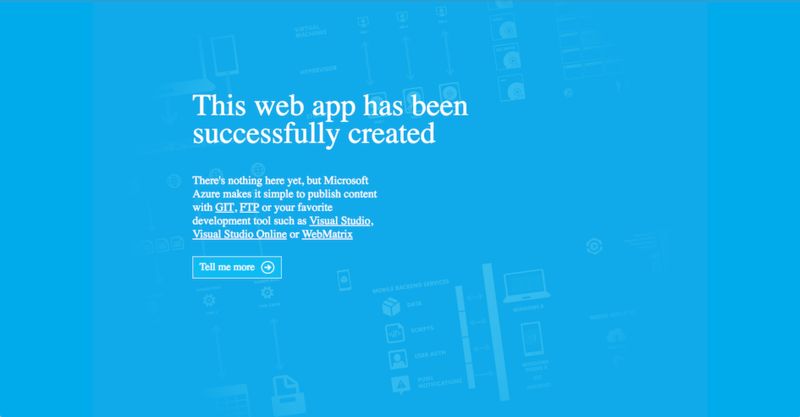 Your Azure Website is ready! But to run a Symfony site, you need to configure just a few additional things. This section of the tutorial details how to configure the correct version of PHP to run Symfony. It also shows you how to enable some mandatory PHP extensions and how to properly configure PHP for a production environment. Even though Symfony only requires PHP 5.5.9 to run, it's always recommended to use the most recent PHP version whenever possible. Earlier versions are no longer supported by the PHP core team, but you can update it easily in Azure. To update your PHP version on Azure, go to the Application settings under SETTINGS and select the version you want. Click the Save button in the bottom bar to save your changes and restart the web server. Choosing a more recent PHP version can greatly improve runtime performance. 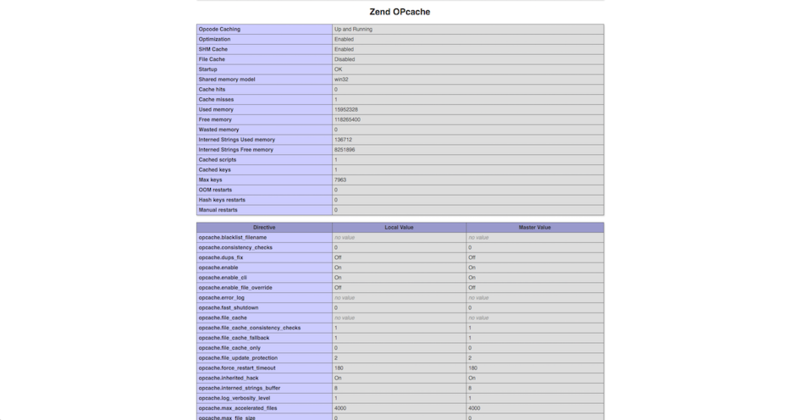 PHP 5.5 ships with a new built-in PHP accelerator called OPCache that replaces APC. On an Azure Website, OPCache is already enabled and there is no need to install and set up APC. The following screenshot shows the output of a phpinfo script run from an Azure Website to verify that PHP 7.0 is running with OPCache enabled. Microsoft Azure allows you to override the php.ini global configuration settings by creating a custom .user.ini file under the project root directory (site/wwwroot). None of these settings needs to be overridden. The default PHP configuration is already pretty good, so this is just an example to show how you can easily tweak PHP internal settings by uploading your custom .ini file. You can either manually create this file on your Azure Website FTP server under the site/wwwroot directory or deploy it with Git. You can get your FTP server credentials from the Azure Website Control panel under the Dashboard tab on the right sidebar. If you want to use Git, simply put your .user.ini file at the root of your local repository and push your commits to your Azure Website repository. 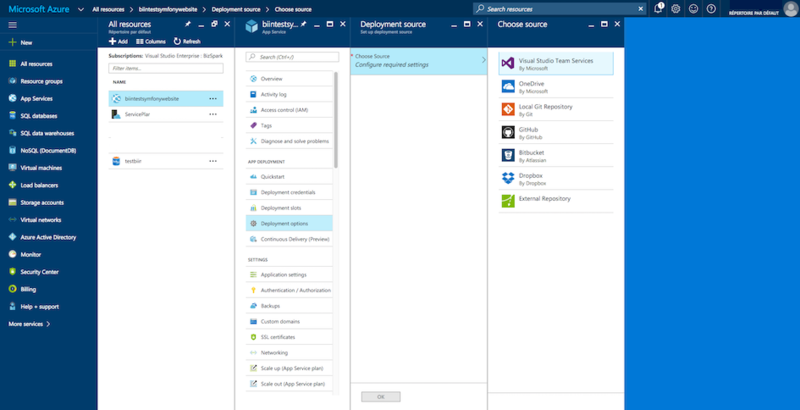 Deploying from Git is dedicated to explaining how to configure your Azure Website Git repository and how to push the commits to be deployed. You can also learn more about configuring PHP internal settings on the official PHP MSDN documentation page. The intl extension is now enabled by default. The following steps are no longer necessary. You can check if the intl extension is enabled in the phpinfo page. However if the intl extension is not enabled you can follow these steps. This is the tricky part of the guide! To enable the intl extension, there is no need to upload any DLL files as the php_intl.dll file already exists on Azure. In fact, this file just needs to be moved into the custom website extension directory. Kudu is a set of tools to manage your application. It comes with a file explorer, a command line prompt, a log stream and a configuration settings summary page. Of course, this section can only be accessed if you're logged in to your main Azure Website account. 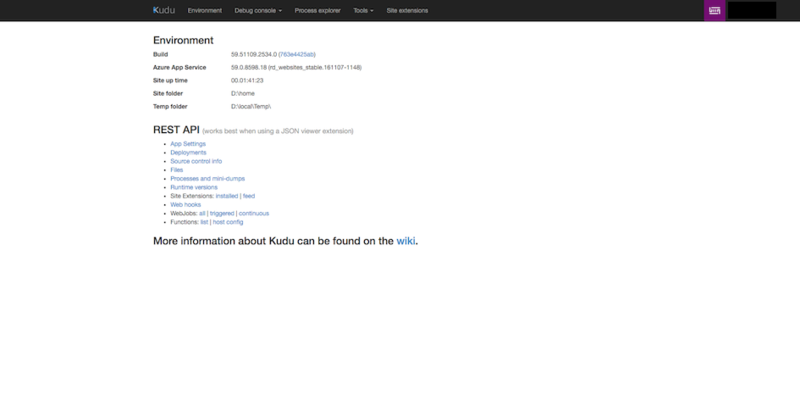 From the Kudu front page, click on the Debug Console navigation item in the main menu and choose CMD. This should open the Debug Console page that shows a file explorer and a console prompt below. In the console prompt, type the following three commands to copy the original php_intl.dll extension file into a custom website ext/ directory. This new directory must be created under the main directory site/wwwroot. To complete the activation of the php_intl.dll extension, you must tell Azure Website to load it from the newly created ext directory. 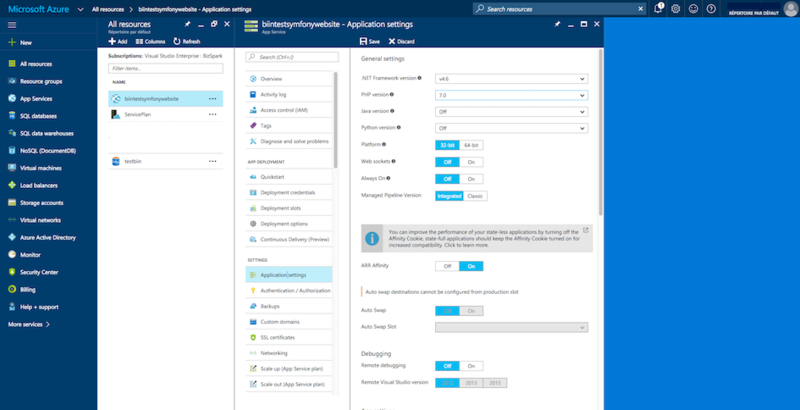 This can be done by registering a global PHP_EXTENSIONS environment variable from the Application settings page of the main Azure Website control panel. Great! The PHP environment setup is now complete. Next, you'll learn how to configure the Git repository and push code to production. You'll also learn how to install and configure the Symfony app after it's deployed. Get your Git from the git-scm.com website and follow the instructions to install and configure it on your local machine. Now, you'll want to connect your local Symfony application with this remote Git repository on Azure Website. If your Symfony application is not yet stored with Git, you must first create a Git repository in your Symfony application directory with the git init command and commit to it with the git commit command. 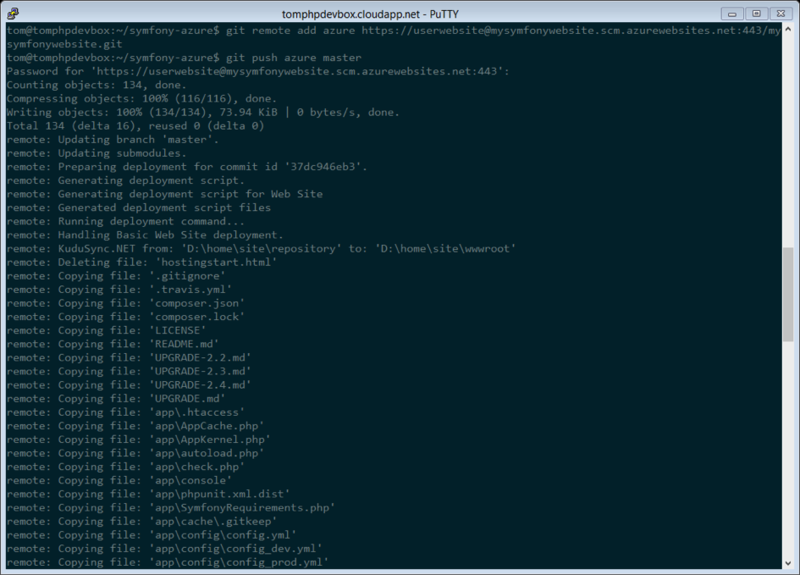 The .gitignore file asks Git not to track any of the files and directories that match these patterns. This means these files won't be deployed to the Azure Website. Don't forget to replace the values enclosed by < and > with your custom settings displayed in the Deployment tab of your Azure Website panel. The git remote command connects the Azure Website remote Git repository and assigns an alias to it with the name azure. The second git push command pushes all your commits to the remote master branch of your remote azure Git repository. 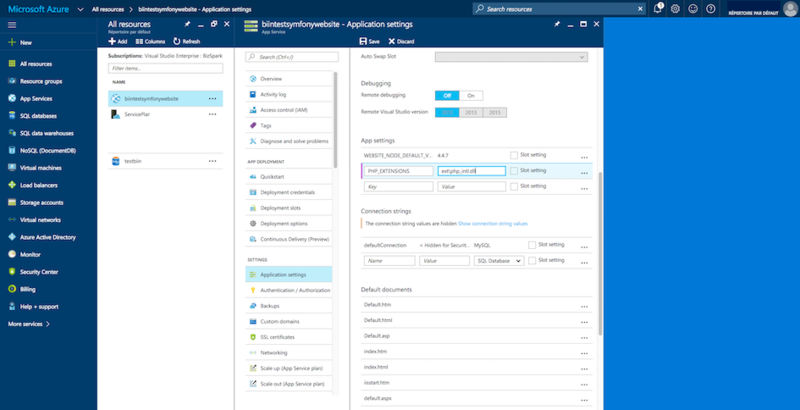 The code of the Symfony application has now been deployed to the Azure Website which you can browse from the file explorer of the Kudu application. 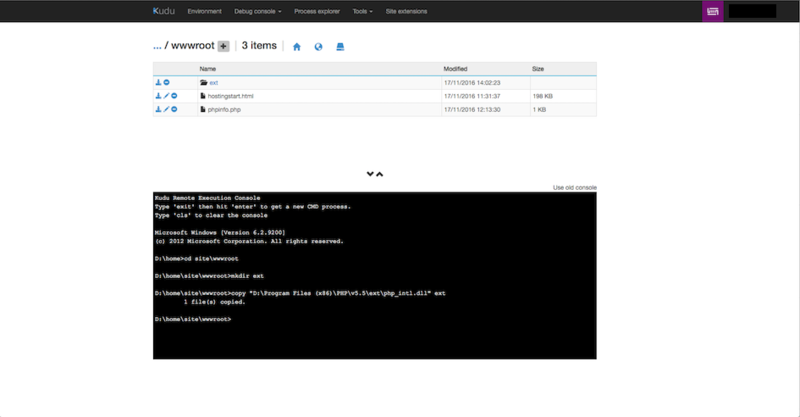 You should see the app/, src/ and web/ directories under your site/wwwroot directory on the Azure Website filesystem. The curl command retrieves and downloads the Composer command line tool and installs it at the root of the site/wwwroot directory. Then, running the Composer install command downloads and installs all necessary third-party libraries. This may take a while depending on the number of third-party dependencies you've configured in your composer.json file. At the end of the composer install command, you will be prompted to fill in the values of some Symfony settings like database credentials, locale, mailer credentials, CSRF token protection, etc. These parameters come from the app/config/parameters.yml.dist file. The most important thing in this article is to correctly set up your database settings. You can get your MySQL database settings in the Application settings page. Simply click on the Show connection string values link to make them appear. The displayed MySQL database settings should be something similar to the code below. Of course, each value depends on what you've already configured. Switch back to the console and answer the prompted questions and provide the following answers. Don't forget to adapt the values below with your real values from the MySQL connection string. Don't forget to answer all the questions. It's important to set a unique random string for the secret variable. 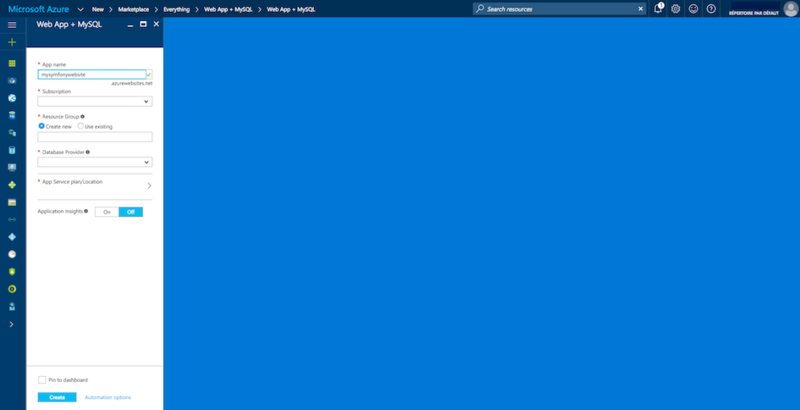 For the mailer configuration, Azure Website doesn't provide a built-in mailer service. You should consider configuring the host-name and credentials of some other third-party mailing service if your application needs to send emails. Your Symfony application is now configured and should be almost operational. The final step is to build the database schema. This can easily be done with the command line interface if you're using Doctrine. In the online Console tool of the Kudu application, run the following command to mount the tables into your MySQL database. 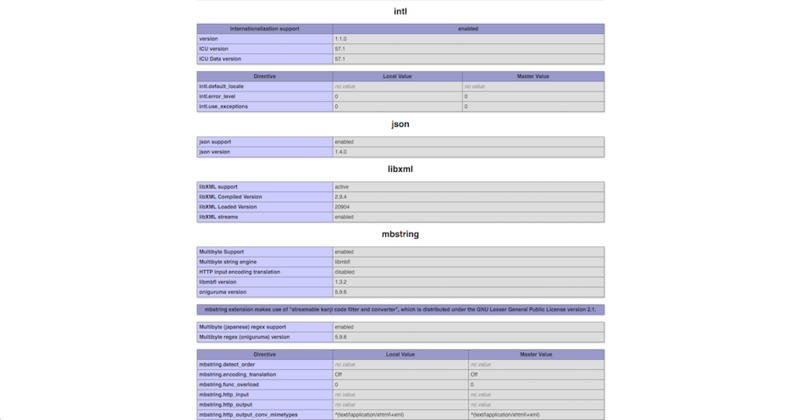 This command builds the tables and indexes for your MySQL database. If your Symfony application is more complex than a basic Symfony Standard Edition, you may have additional commands to execute for setup (see How to Deploy a Symfony Application). If Symfony is correctly installed, you should see the front page of your Symfony application showing. As you can see, the latest rule RewriteRequestsToPublic is responsible for rewriting any URLs to the web/app.php front controller which allows you to skip the web/ folder in the URL. The first rule called BlockAccessToPublic matches all URL patterns that contain the web/ folder and serves a 403 Forbidden HTTP response instead. This example is based on Benjamin Eberlei's sample you can find on GitHub in the SymfonyAzureEdition bundle. 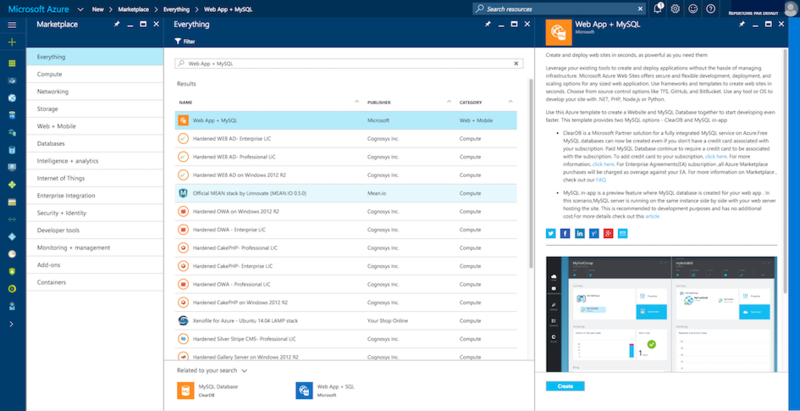 Deploy this file under the site/wwwroot directory of the Azure Website and browse to your application without the web/app.php segment in the URL. Nice work! You've now deployed your Symfony application to the Microsoft Azure Website Cloud platform. 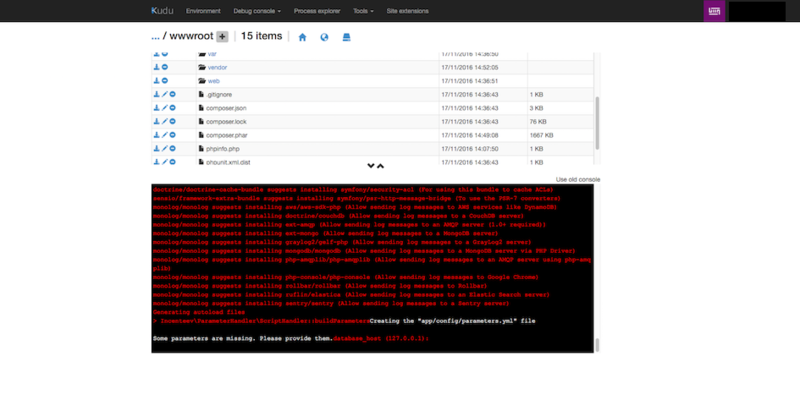 You also saw that Symfony can be easily configured and executed on a Microsoft IIS web server. The process is simple and easy to implement. And as a bonus, Microsoft is continuing to reduce the number of steps needed so that deployment becomes even easier.